That garden I talked about in my last post contains a lot of butterfly friendly plants. I work in a pretty urban neighborhood, but there are lots of gardens and it's not that far to parks, woods and the river. So we DO get butterflies and I do my best to encourage them. Most springs I buy a jar of Painted Lady butterfly larvae and let the kids observe them turning into butterflies. When they hatch, I keep them at the library for a day or two so the kids can see them, then take them home so that my girls and I can release them. I wasn't able to manage that this month, but I hope to do so during June. And by then, a lot of the flowers outside will be in bloom! I started this week's programs by reminding the kids and adults of how we'd read "Planting A Rainbow" last week, all about planting a flower garden. 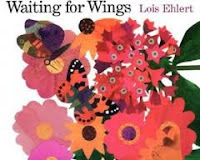 And then we read this book, also by Lois Ehlert, showing the caterpillar eggs on the plants, the caterpillars, the butterflies and then the butterflies heading for the flower garden. I made sure to point out the big Tiger Swallowtail butterfly--we get those around here quite a bit. 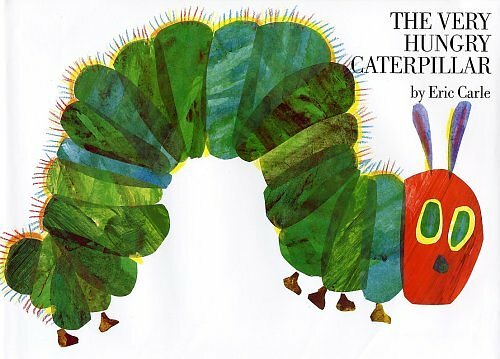 I don't buy Disney books, or TV books for my library for two reasons--one, they're substandard lit and two,we all own them in our homes.But not everyone owns something like Eric Carle's "Very Hungry Caterpillar"--and that's why it's just the sort of book that needs to be there to discover in the library. And I've never been to a preschool or kindergarten that doesn't own this book! They have it because it's loaded with good stuff. Colors. Days of the week. Fruits. Counting. How a caterpillar becomes a butterfly. Above all, it's a story told simply but with perfectly chosen words. It's so good that all the kids who DO know it greet it with delight and are thrilled to read it again, chiming in on the "still hungry" lines. Toy and moveable books last about 15 minutes in the library, but they can really be a fabulous addition to a story hour. This one is one of my favorites. Lucy (who is a lot cuter than "Ladybug Girl" in HER ladybug dress)goes through her garden looking for her butterfly. Cut holes in the pages frame everything from a pink worm to a family of ladybugs. 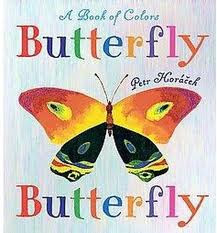 And when Lucy finally finds her butterfly, the book opens to a two page pop-up butterfly like the one on the cover, a butterfly that will "flap" as you slowly open and close the covers. Spectacular! My Tuesday group has been my smaller group lately, so they've gotten gypped out of some of the movement activities I've done with the Wednesday crowd. This week I decided to even the score and brought out my scarf box. 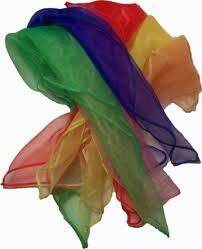 These are the juggling scarves I bought for use at my annual "Nutcracker" program--they're from Oriental Trading, are inexpensive and endlessly useful. We used them to dance to Nancy Stewart's "Dancing Rainbow Colors" (and Nancy is a marvel--everything on her site is downloadable for your use!) and to Johnette Downing's incredibly catchy "Rhythm In the Scarves"--it's my favorite scarf song from her album full of scarf songs "The Second Line"
The Wednesday group didn't get the scarves, but they did get to play one of their favorite games--another Nancy Stewart gem called "I'm Hopping Like A Bunny". Nancy uses a slide whistle for this song, and I happen to have a dandy one I bought years ago (believe it or not, from Lands End of all places), but if you can't scare one up a bell or other whistle would work just fine. The kids love this game and it's great to build listening skills--waiting for the whistle before falling down! And the challenge to me is to come up with a movement that works for any animal the kids can pick! Now you have two lovely wings Flap your wings! This is my last "regular" story time until September. My summer programs are going to be larger programs, done with lots of storytelling and very few books. Lots of fun, and a special challenge. More on those, and on my special toddler program to come in the weeks ahead! Theme of the Week: It's A ZOO In Here!